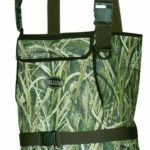 Allen Cattail bootfoot neoprene chest waders are designed for duck hunting and come in Mossy Oak camo. With around $150 they are mid range neoprene hunting waders and in this review, I will test how they perform and if they are worth their money. Like most other duck hunting waders, the Allen Cattail bootfoot are made from neoprene. Neoprene is more durable than most breathable materials and insulates better. The Cattail waders are made from 3.5mm material and are therefore suitable for most of the duck hunting season. If you look for something warmer than that, performing better during early spring or late season, then 5mm might be a better fit. Both variations will perform well during duck hunting and withstand some challenges were breathable waders would tear up quickly. The stitching looks promising and well made, with the exception of the attached knee pads. They look like the thread used here could loosen up easily, but since the knee pads are only stitched on top of the waders, this will not affect their ability to keep you dry. You might have to fix that with some glue, considering that restitching them might result in leaks. The rubber boots come with 1000gr 3M™ Thinsulate™ insulation which will keep you warm during the same temperatures the rest of the wader does. This is desirable since everything else would result in either sweaty or cold feet. Their boot tread looks surprisingly good for bootfoot waders. The sizing is a bit strange. While the legs have plenty of room, the crotch area is pretty tight. 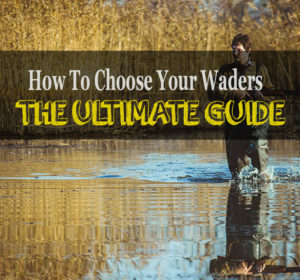 The wading belt sits too low and therefore the waders are not as high as it should be the case for chest high waders. First I thought that this might be the case because I ordered a wrong size, but the boots were already more than big enough. I usually never struggle with sizing, since I am from a very average build, which lets me think, that others might struggle as well with this problem. However this sounds worse than it actually is, I was still able to wear them. The boots provide enough room for an additional pair of warm socks, which is always a nice option to have. The included wading belt might be too tight for some people. The feature that catches one’s eye first is the Mossy Oak camo. Another widely used and popular pattern for waterfowl or duck hunting. You will not be invisible but it does a good job in hiding you, at least your bottom half. You will find an oversized pocket on the front side as well as a handwarmer pocket to provide warmth if you do not wear gloves. The Allen Cattail waders come with adjustable suspenders and a pair of D-rings on the front end, suitable for shell holders, calls or similar. As mentioned earlier they also offer reinforced knee pads, making them more resistant to possible tears that could happen while kneeling. This can improve their longevity greatly. The boots are insulated with 1000gr 3M™ Thinsulate™ and come with a hard toe cap. If you ever hit your toe on something hard that you didn’t see in murky water, you know how painful that can be. Toe caps prevent that from happening and are something I do not want to miss anymore. Even though that is a must have feature in wading boots, this is not standard for bootfoot waders and nice to have. The boots also have an included steel arch which makes them feel more like proper shoes than rubber boots. All in all, Allen did a great job in designing them. A wading belt is included and should be worn as soon as you enter the water. Since they are too tight in certain areas, I had the impression that they are limiting my movement slightly. It was not too annoying and comparable to wearing 5mm neoprene. If you wore that material before, then you know that you can still perform well, so nothing to worry about. As mentioned earlier, the tread does not only look well, it also provides decent grip in the river. I had no trouble walking over mossy stones and felt safe while moving around in the water. This is a huge plus since it greatly adds to the safety of such waders. As usual, I did a small one-mile hike in them to reach my next fishing spot and crossed dense bushes while doing so. I do this for a quick test of how well they would perform over time and how durable they are. During my time fishing afterwards, I did not notice any leaks. The insulation worked well, I was wearing them in 50-degree cold water and my legs, as well as my feet, stayed comfortably warm, without additional socks. I am quite sure they would perform well in even colder water down to 40 degrees without problems. If you are looking for a cheap pair of duck hunting neoprene waders the Allen Cattail Bootfoot Neoprene Waders are a decent choice. For around $150 there is nothing really to complain about, and they come with some of the best boots I saw on bootfoot waders so far. This is definitely a pair I would recommend. If you are looking for a different camo pattern check out the Waterfowl MAX-5 neoprene waders review. They are very similiar in terms of features and design.